Residents and fellows socialize at a lunch during the inaugural McGaw Resident and Fellow Wellness Week. As part of the inaugural McGaw Resident and Fellow Wellness Week, Northwestern housestaff gathered to hear a lecture on identifying and avoiding physician burnout. “As physicians, residents inherently have an appreciation for the importance of wellness in a multifactorial sense, but I think that we tend to neglect our own wellness during the hustle and bustle of residency,” said Caitlin Chambers, MD, chief resident in Orthopaedic Surgery and co-vice president of the McGaw Housestaff Association. In addition to the session on burnout, residents and fellows had an opportunity to learn about financial planning and how to take advantage of the benefits offered by the McGaw Medical Center of Northwestern University. Other sessions gave residents and fellows the opportunity to sample ways to incorporate new behaviors into their schedules in order to improve their own wellness, such as yoga and meditation. “I hope that the inaugural Wellness Week at least serves as a reminder to residents and fellows that their personal wellness is deserving of attention,” Chambers said. Alexandra Aaronson, MD, resident in Psychiatry and co-vice president, and Richard Matulewicz, MD, resident in Urology and co-president, were also involved in planning the week’s activities. 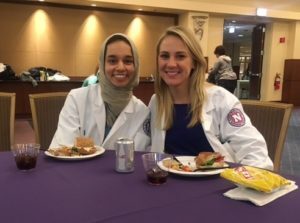 The events were hosted by the McGaw Medical Center of Northwestern University, Northwestern Memorial HealthCare’s Office of Academic Affairs and the McGaw Housestaff Association.